Please refer to our stock # 10906 when inquiring. 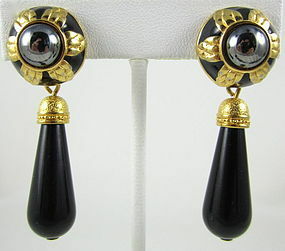 These lovely vintage earrings by Fendi are 2" long x 3/4" wide and both have a bright gold finish with black enamel accents. They have black acrylic drops and hematite finish cabochon tops. They are in very good condition and both are signed "Fendi" on the reverse.